One thing that connects all Africans across the continent is FOOD! We love food so much that we fight about who makes the best version of certain dishes specifically Jollof rice but we all know the Senegambia’s do (I couldn’t help myself). While we love food to no end and relatively cook healthy meals with organic veggies and produce, by the time it’s on our plate all the nutrients have been fried and seasoned so good that the kale (we have been eating this for years), spinach and okra is as unhealthy as a burger from McDonalds. This and several other reasons is why Tambra Raye Stevenson founded the WANDA: Women Advancing Nutrition, Dietetics and Agriculture non-profit organization. WANDA is a registered nonprofit in Washington, DC and Abuja, Nigeria whose mission is to educate and inspire girls and women about the nutritional components of the dishes we cook, how best to cook them for healthier outcomes and mostly importantly, to teach our communities about the existence of non-communicable diseases like obesity, diabetes and heart disease. 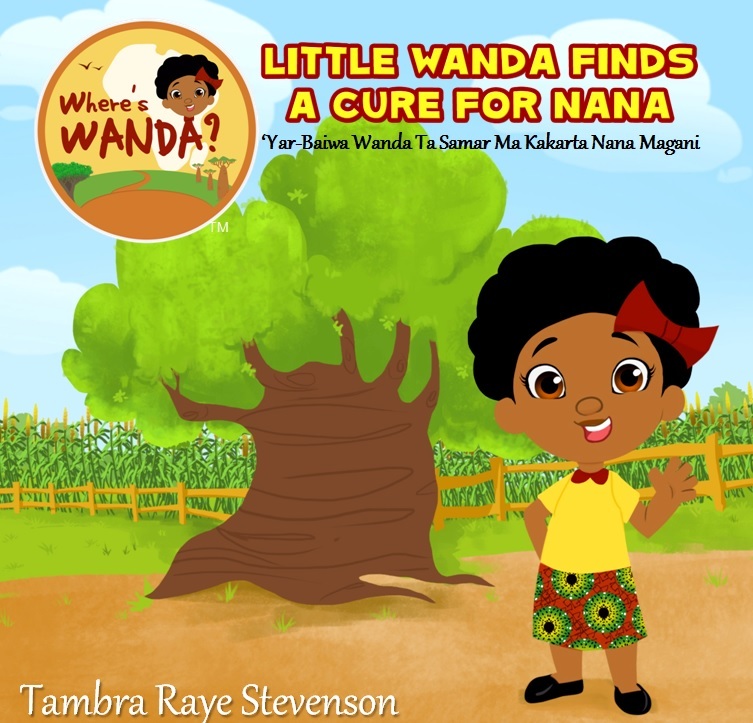 As with all non-profit’s WANDA is looking to make a difference in the lives of many but what makes WANDA so special and unique is the innovative approach to capture the attention and hearts of little girls everywhere with the introduction of the Where’s WANDA character and book series. The cute and curious WANDA travels from America to our beautiful continent on a food adventure empowering and educating all she comes across. This multi-faceted approach is a recipe for success, we had to know more! 1. Tell us your story. Where did the idea for WANDA come from? And what made you take a leap of faith to self publish your first book? As a mom of two young children and a nutrition educator, I am on a mission to develop a new generation of healthy eaters, readers and leaders. Personally, I saw the impact of having no access to nutrition education in my community; now I am championing for better nutrition education and healthy food access. After seeing my grandmother in Oklahoma die from complications of diabetes and my grandfather die from heart disease and a stroke, I became my family’s college graduate and first public health nutritionist. And, when my daughter was four she got a cavity in school because the teacher gave junk food as rewards. After talking with her I thought no amount of policy was going to change her teacher’s mind and classroom. I needed to create an army of women and girls on the frontline as food freedom fighters who value our health, our legacy, our voices, and our communities. I realized we need to shift our values. So I thought the answer would be in valuing my womanhood and my roots; so I began to learn how my African heritage foodways can improve our health. 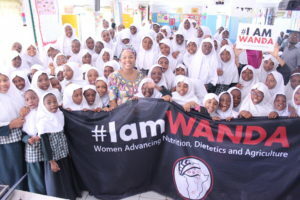 So, I traveled to Nigeria to connect to my Fulani roots and give back by creating WANDA: Women Advancing Nutrition, Dietetics and Agriculture as a registered nonprofit in Washington, DC and Abuja, Nigeria. To champion our mission, I created the “Where’s WANDA?” bilingual book series to inspire my daughter’s generation to become food sheroes in our communities and be like Little WANDA. 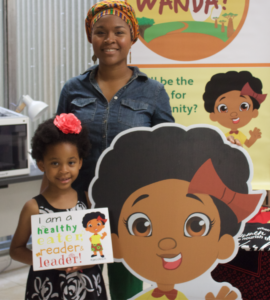 Frankly, there were no girl characters like my daughter promoting good nutrition especially focused on African heritage foods. So I said to myself that needed to change. So meet Little WANDA, the new #BFF to Doc McStuffins and Dora the Explorer! As the “Beyonce of nutrition,” Little WANDA, the girl character, will carry the torch of former First Lady Michelle Obama here in the Diaspora and Africa. I realized that when we empower women and girls, we nourish the world. WANDA matters locally and globally because food heals and creates peace that we need in our communities. And ultimately women and girls are the meal healers we need locally and globally. Now I value the voices of women and girls to lead the charge like First Lady Obama because I have learned to value my own now. For me self-publishing appeared to be the road of least resistance. The idea of hunting for an agent seemed tedious. Also, I had a vision of what I wanted to achieve with the book series and wanted to keep the integrity of the book series intact, and I had a assembled a smart network of friends and colleagues in pediatrics, nutrition, food writing and children’s book writing to provide input. So self publishing was an obvious route to ensure the full completion of my vision. Lastly, I knew from creating the book I can use it as a calling card to show interested agents of what I have been able to achieve as an independent publisher. 2. Self publishing is both a challenging and rewarding process. What was the most challenging aspect of your process and what was the most rewarding? I had a steep learning curve in transitioning from a book lover to a book producer. The challenge was my mental limitations. Since it was a new endeavor I had more questions than answers from finding an illustrator, editing, storytelling for kids, finding a printer, formatting the book and how to distribute. I would contact friends for referrals which was helpful in finding an illustrator. Yet, understanding self-publishing platforms which some have built in distribution models was another challenge with its limitations. So, I opted to build a relationship with a local book printer and help me navigate and understand the book making process from size, paper, binding and more. Another challenge is distribution which the benefit of programs like IngramSpark is getting access to markets like Barnes and Noble. Distributing books or products on Amazon maybe great for consumers’ wallets but not for profit making for small businesses or new authors unless you have a pre-orders lined up or pumping consistently high-volume of products. The most rewarding process is bringing the character to life and seeing the smiles on the faces of adults and children when they meet her. They fall in love with her and her journey as I have. 3. The Where’s WANDA? book series is connected to the nonprofit, WANDA: Women Advancing Nutrition, Dietetics, and Agriculture tell us about it. What’s the mission? What has been your impact thus far? A portion of the proceeds from the book sales along with other products such as the WANDA wear support the mission of WANDA to build a pipeline and platform of women and girls to lead in the food system to create healthier and sustainable communities. WANDA was born out of love to heal our community by inspiring, engaging and informing women and girls of color to honor our ancestors: 1) by embracing our foodways to heal ourselves and our communities; 2) becoming a healthy food entrepreneur and 3) advocating for healthy food policies for their communities. Ultimately, we are planting the seed for the “soul sisterhood of the soil” to take root and bear fruit for the community to thrive. WANDA is rapidly becoming the go-to organization on women and girl empowerment in the food space. In 2016, WANDA was selected in the top 10 as Champion for Children’s Wellbeing by ASHOKA/Robert Wood Johnson Foundation. WANDA organized policy panel at the World Bank/IMF Spring Meetings on investing in agriculture and nutrition by empowering women and girls. WANDA now serves the Food Trust’s National Working Group on Health and Food Equity with members like American Heart Association, Alliance for a Healthier Generation and NAACP. This year I spoke on the Child Nutrition Reauthorization legislation held by the Congressional Hispanic Caucus Institute on Capital Hill. In 2016, while launching WANDA, I was appointed by Washington, DC Mayor Muriel Bowser to serve on the DC Food Policy Council to address developing a healthy and equitable local food economy in Washington, DC. I have received messages and interests from women and men in Africa and Diaspora to support WANDA. This year we held the first annual WANDA awards in Washington, DC honoring women of the African diaspora who are diplomats, entrepreneurs, media makers and culinarians trailblazing in the food system. I have raised awareness and action on international and national media outlets on importance of nutrition and gender equity with Nigeria’s TVC, Voice of America, She Leads Africa, Food Tank, Black Enterprise, WPFW-FM, and WKYS-FM to name a few. WANDA raised funds to provide nearly 200 nutritiously balanced meals to children and families in the Internally Displaced Persons (IDP) camps in Abuja, Nigeria who fled from the north due to Boko Haram. Also, we provided nutrition outreach and Where’s WANDA? Workshops to over 300 school girls in Kano, Yola and Abuja, Nigeria. I created and piloted in 2016 Africa Farm to Fork Entrepreneurship Boot camp providing technical assistance for women-led food businesses from the African Diasporan communities. We have sold and donated over 450 “Where’s WANDA? books in 6 month. I launched the Where’s WANDA? book series at the U.S. Library of Congress in September 2016 for Childhood Obesity Awareness Month and African Heritage Month. WANDA received the 2016 DC Divercity Fund grant to pilot the WANDA Africa Farm to Fork Leadership Academy. WANDA received the Fest Africa 2016 Honors for its community service impact in Africa and the Diaspora awarded by the Afropolitan Youth Association. We provide live streaming of our WANDA whereabouts to engage online supporters which are nearly 400 Twitter followers, close to 350 Instagram followers, nearly 1800 Facebook fans, 7,000+ newsletter subscribers. WANDA has been invited to speak at teaching hospitals, universities and nonprofit organizations in DC, Sweden, Oklahoma and Nigeria. 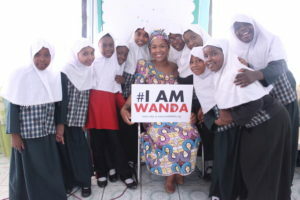 I have held “Where’s WANDA?” workshops to over 400 children, educators and parents in our launch in Nigeria. This summer we are holding our first Little WANDA’s Garden Day Party in Washington, DC. 4. What’s next for WANDA? We are on a book tour promoting Where’s WANDA? So we are open to invitations to come to a city or country near you. We are currently producing a 3-D animation of the first book which will be completed this Fall. Also, we are currently creating Little WANDA muppet to engage classrooms, clinics and communities to share her amazing food journey. By the end of this year we will launch a crowd-fund campaign to create Where’s WANDA? dolls to deliver with the books to the school girls in Nigeria. And for the women, we will be planning our next food business boot camp and WANDA Awards held in March 2018 to honor trailblazing women of the African diaspora in the food system. 5. What are the three best practices you have learned as an entrepreneur? Gain inspiration from other sectors. 6. Best thing about your journey thus far? 1. What is your favorite afropop song at the moment? 2. If you could have lunch with any person who would it be and why? I would like to have lunch with First Lady Michelle Obama to share the work of WANDA and provide a copy of Where’s WANDA? to her. I want her to know Little WANDA will continue the food fight and bring a million women and girls with her on the frontline to improve our communities healthfully and sustainably. 3. What’s your overarching vision for Africa? My vision for Africa is to invest in its African cuisine and train the next generation of sustainable farmers, culinary creators, food innovators and nutritionists. We need to build up the local food economy and African gastronomy by smashing through the silos and finding the connection between health care, agriculture, nutrition and the culinary world with a balanced approach of ancestral wisdom and technical innovation. We need more investments in document the knowledge with user-friendly accessible platforms to the knowledge. And above all women and girls are leading the way because when we uplift women and girls, we can reduce poverty.